In the fall of 2012, Bob Avakian gave a series of talks in different cities. This is a film of one of those talks. My personal invite to you is based on what’s possible, and necessary, and what’s true. Often, people ask me why I haven’t quit trying, in discouragement, to change the world, or even to just stop the crimes of the US government through a mass movement of people, as supporters of World Can’t Wait are working on. The challenges are obvious, and I am aware of how rare – much too rare — it is to refuse to give in. Part of the answer to why I’ll never give up is that I’m continually outraged, and don’t accept this as the “best” of all possible ways the world could be. I came of age in the 60′s, amongst the struggles of Black people, women, people around the globe struggling for justice and liberation, which set the stage for being a rebel. More significantly, I saw the possibility of a much better society because the largest country in the world then was socialist – The Peoples’ Republic of China. The most vibrant, scientific, inspiring propagators of revolution internationally were the revolutionary communists who came out of that worldwide movement. At the center of that ferment was Bob Avakian, BA, the leader of the Revolutionary Communist Party, USA. I heard him speak late last year. BA made an extremely deep-going call to get with the movement for revolution, calling out the crimes of the imperialist system, envisioning how society could be, outlining the strategy to work through the huge challenges in how to get there. He said something that has stuck with me, and I’m paraphrasing here, that if you see all those horrors, and you know it doesn’t have to be that way, why would you not want to be working and struggling to end this? He talked about the need to confront reality, looking at the horrors this system creates, continually, and then applying science to transform the contradictions to create a whole different world. That resonates with me. You can get more, right now, from BA by listening to an interview with Michael Slate on KPFK, where he went into these points. socialist state which would embody, institutionalize and promote radically different relations and values among people; a socialist state whose final and fundamental aim would be to achieve, together with the revolutionary struggle throughout the world, the emancipation of humanity as a whole and the opening of a whole new epoch in human history–communism–with the final abolition of all exploitative and oppressive relations among human beings and the destructive antagonistic conflicts to which these relations give rise. 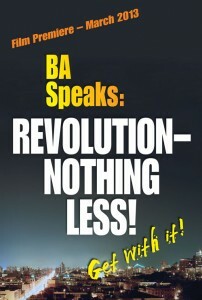 Hearing BA in BA Speaks: REVOLUTION-NOTHING LESS! in a theater with hundreds of others on the road to discover what can be done to end this madness and bring about the emancipation of all humanity is something I invite you to join me in doing. What could be more important? The film is simultaneously premiering in Chicago, San Francisco, and Los Angeles in addition to Harlem. Details and tickets here. 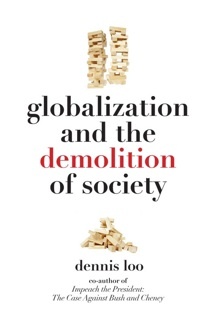 My colleague on the Steering Committee of World Can’t Wait, Dr. Dennis Loo, has a new book on a huge topic, even for a sociologist, Globalization and the Demolition of Society. It’s really several books in one, and ambitious. You wouldn’t expect less, since his last book was Impeach the President: The Case Against Bush & Cheney. Dr. Loo does more than recount the destruction of the global environment on the altar of capitalism-imperialism. He goes after the fundamental flaws in the ideology of the people who run this country. I can imagine students walking into his class with the typical mindset that, with all its flaws, “at least the United States has democracy and freedom.” And, bam, suddenly those assumptions get challenged. Think of this book as that course, without the quizzes and homework, but with the back-up material. In contrast to that philosophical framework that denies it’s possible to determine what’s objectively true, Dr. Loo argues that it is necessary, and possible, to understand and confront what is objectively true, an important distinction if we want to act to change the world. That in itself is a huge contribution. And that’s only the first book within his book. 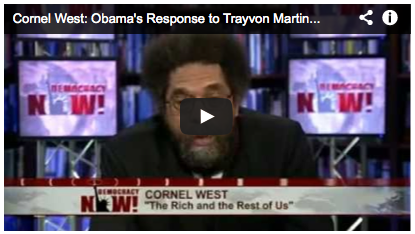 Dr. Loo tackles the underlying why and how of these outrages which I call systematic crimes. If enough people read this book, it could help change the course of history. For the rest of September, a portion of proceeds from the book’s sale will go to World Can’t Wait. So please order, and ask your library to order one also. The political terrain is changing hourly in the Middle East, with governments responding to the peoples’ uprising in different ways. But we’re seeing one constant: the U.S. at every point pushes its own interests, regardless of the status of the peoples’ rights. World Can’t Wait exists to “stop the crimes of our government.” So we should be vigilant. We’ve pointed out Washington’s deep and long support for repressive regimes across the region, including Egypt, Yemen, Jordan, Saudi Arabia & Bahrain, and also the huge amount of military and political support given to Israel by successive U.S. administrations. In Bahrain, where the U.S. has a strategic base, Hillary Clinton weakly, and hypocritically, defended the protesters’ rights (only days after witnessing prominent anti-war veteran Ray McGovern brutalized during a speech of hers in the US). 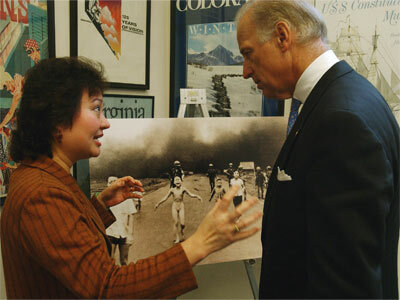 As if she and the government she has long represented was unaware of what these regimes do to their people! In Egypt, protesters showed the lethal tear gas canisters used against them by the government – labeled “Made in the USA.” These were just a small fraction of the overall budget of military aid given to Egypt by the US. In Libya hundreds of people are being slaughtered in the streets by mercenaries. Though Qaddafi’s government has appeared more oppositional to the U.S., the U.S. reestablished full diplomatic relations with Libya, under pressure from U.S. oil companies. Military aid followed. But in the wake of the absolutely righteous upsurge of the people against Qaddafi’s repression, will the U.S. take the opportunity to install a more compliant government to its own interests? U.S. military intervention will do no more good in Libya than it’s done elsewhere… which is to say: it will be a disaster for the people, but good for U.S. interests in holding onto strategic oil and territory. In Pakistan, there’s news of the first drone strike in a month, this one killing civilians: US Drone Strikes Kill 15 in Pakistan. Despite a major escalation in the number of unmanned Predator strikes being carried out under the Obama administration, data from government and independent sources indicate that the number of high-ranking militants being killed as a result has either slipped or barely increased. Even more generous counts – which indicate that the CIA killed as many as 13 “high-value targets” – suggest that the drone program is hitting senior operatives only a fraction of the time. The New America Foundation estimates that at least 607 people were killed in 2010, which would mean that a single year has accounted for nearly half of the number of deaths since 2004, when the program began. Overall, the foundation estimates that 32 of those killed could be considered “militant leaders” of al-Qaeda or the Taliban, or about 2 percent. There’s the gross hypocrisy of the U.S. State Department invoking lofty “rule-of-law” and diplomacy principles under the 1961 Vienna Convention on Diplomatic Relations — the very same State Department that just got caught systematically violating that convention when WikiLeaks cables revealed that U.S. “diplomats” were ordered to spy on U.N. officials and officials in other countries. Then there’s the delusional notion — heard mostly from progressives with romanticized images of the State Department — that WikiLeaks’ release of diplomatic cables was terrible because it’s wrong to undermine “diplomacy” with leaks, since the State Department (unlike the Big, Bad Pentagon) is devoted to Good, Humane causes of facilitating peace. As this episode illustrates, there’s no separation among the various arms of the U.S. Government; they all are devoted to the same end and simply use different means to accomplish it (when the U.S. Government is devoted to war, “diplomatic” functions are used to bolster the war, as Colin Powell can tell you). You are currently browsing the archives for the imperialism category.